Leuk met die klavertjes. Heb er mijn verse kruidenpotjes mee beplakt en dat blijft goed zitten. Warranty stickers have a special adhesive layer with the text "void", wich remains visible during removal and is difficult to remove. Ideal for identifying your belongings. 45 pcs. 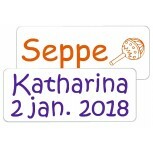 Warranty stickers have a special adhesive layer with the text "void", wich remains visible during removal and is difficult to remove. Ideal for identifying your belongings. 40 pcs. 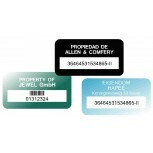 Personalized property labels, for a perfect overview of your stuff. 40 pcs.